I can’t believe summer is already rolling into getting ready for school. And I know many of you are wondering what will I put in the kid’s lunch boxes this year. 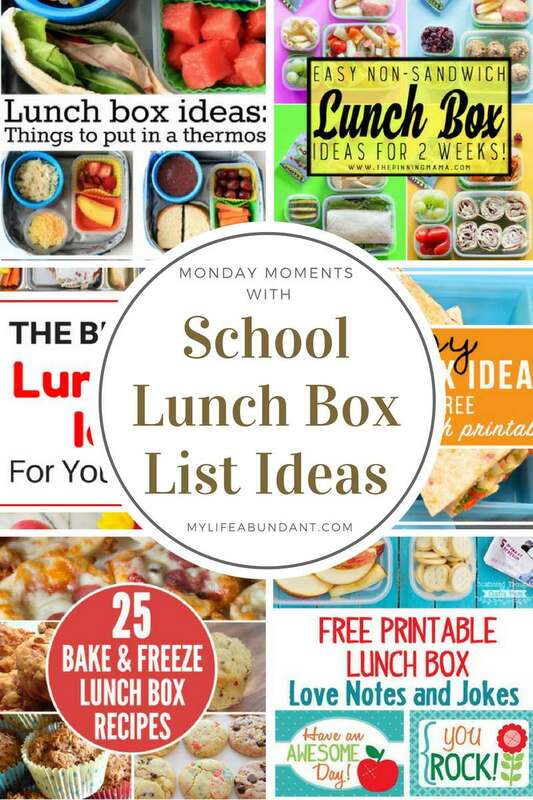 I put together a great group of lunch box idealists that may help you get started this school year. If your lunch box has a thermos, here is a great list by My Mommy Style with several lunch ideas for a thermos. I love all the clever ideas and its just not for liquids anymore. The Pinning Mama has a list of 2 weeks of lunches with no repeats. I know my son use to get so tired of the same lunch every day. Wish I had this list back then. Looking for a healthy lunch box ideas? Vigor It Out has several delicious meal ideas for your lunch box. Easy and quick is two of my favorite words when it comes to meal prep. A Housefull of Sunshine has 100 easy ideas for your lunch box. And let’s not forget making lunches for the freezer. Here are 25 bake to freezer ideas from Childhood 101. I think this would be my favorite way to go. And how about a note or two you can put in your child’s lunch box to just to let them know you are thinking of them. Scattered Thoughts has free printables just for the lunch box.